Well, a big part of it is money. If teachers can get something for free, we’ll take it. 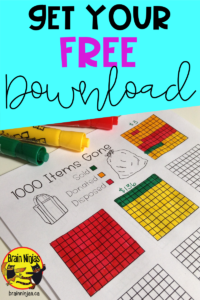 We all know our classrooms are underfunded and so when interesting items come along (whether we actually need them or not) we tend to take them. What is wrong with us? It’s time to challenge yourself to clean the clutter. Why would we need this challenge? Read on my friend. Fifteen years ago a teacher retired and left me several boxes of very special teaching materials. It took me two years to go through it all and I basically couldn’t use any of it. It just didn’t match my teaching style. Some of the items were old photocopies of photocopies that I knew I was never going to use. And yet I felt obligated to take it-and move it from classroom to classroom and school to school. I carried those boxes around for ten years. Then our school was being renovated over the summer and we couldn’t leave anything in our classrooms or storage area. It all had to come home. 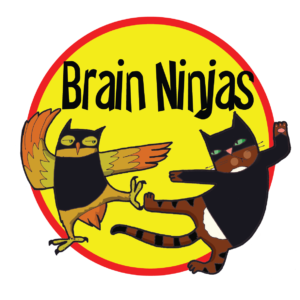 I had 102 boxes of “very important lesson plans and materials” along with all the odd shaped things like pocket charts, calendars, chairs, easels and other odds and ends I had to hide from Mr. Ninja. It took up almost the entire basement and that was the summer we had a minor flood. Since then I’ve worked hard to clear the clutter. I spent that whole summer decluttering. I’ve had to move classrooms three times in the past three years. Even though I’m teaching the same grade, I didn’t unpack any of the first boxes I packed up. So, why do I need all this stuff? It’s time to clear it out. Bring on the spring cleaning (but it was summer)! Anything published before 2000 that isn’t a classic got tossed into the recycling. It’s not useful to anyone. This included lesson plans. I photographed art projects, posters and large samples of student work. I organized these digitally so I still have the samples/exemplars but not the space. I donated all the craft material to a local school’s makerspace. This included a bag of bottle caps that I thought we so precious I had to keep for nearly four years. I scanned or photographed relevant (and current) lessons that I thought might be useful and organized them digitally. All of the paper was recycled and we backed up the files on an external hard drive for safe-keeping. Borders, trimmers and bulletin board letters that I no longer wanted to use and were in good shape went to school to be passed on to new teachers. The rest were recycled. My obscene collection of writing utensils (that only I was allowed to use for some strange reason) went into a large bin and into my classroom so students could use them. It was ridiculous. Who needs 548 Sharpies? And most were lime green and yellow. Many didn’t even work, but I needed to lug them around for years. All those professional development texts that I was forced to own or read once were recycled. Turns out a circular saw can take the binding right off. Who knew?! How many binders does one need? Ones that were cleaned with a Magic Eraser and came out spotless were donated to a local school supply drive. Yucky ones were dismantled and disposed. Books-as in classroom library books we weeded. The special ones are still in my collection as they were often gifts. Not so special ones were boxed up and donated to libraries if they were in perfect condition or given to new teachers if they were gently used. This was the most difficult one, but some of the books were duplicates and there’s this thing called a public library that lets you borrow the books (for free!). Things I hadn’t looked at since I started teaching got tossed without really looking too hard at them. Nobody needs to be bothered with sorting it out. Save that time to sort out something that actually matters. All of the decorations for different holidays-I passed them along to other teachers. Our students bring decorations for events that I just borrow each year. Tools went to a local Makerspace and the items that were too young for school went to a daycare (including a set of children’s books that I thought I would carry around just for fun). Ask some of your helpful students to go through the basket of markers to check if they’re still working. Toss all the ones that aren’t. I went through all of the classroom games and made sure they had all their pieces and could still be used. Games that didn’t were dismantled for parts (sent to makerspaces) or recycled. Student notes and cards made just for me were put into a scrapbook. If I couldn’t remember who gave it to me, it was recycled. Except for the very lovely drawing where I look really skinny. I kept that one as a life goal. Why did I have 13 glass jars all different sizes in a box? No idea. Recycled the odd shaped ones and gave the rest to a science teacher. I can always have students bring in jars for projects later. Electrical cords to who knows what? I round up all these cords that didn’t seem to plug into anything in particular. I cut off the ends and kept some of them for our electricity unit (just what fit in the box) and the rest went to our local ecostation. Baskets, bins and containers were taking over. I put all the containers in one place and counted. It was a three digit number that I’m too ashamed to share. I recycled broken ones, saves my favourites and gave the rest away to unsuspecting teachers by leaving them in various places in the school. Just kidding, I sent an email with a picture asking if anyone wanted them and gave them to the highest bidder. Well, almost all of that is true. There was a box of random things like: a bag of salt, a bag of cornstarch, a sponge, paper cups, straws and a bag of talc. This was probably from a chemistry unit long ago, but I just disposed of all the pieces and recycled the box. Don’t keep food in your classroom unless you plan to eat it. It attracts small critters. And remember, I dragged this box from classroom to classroom and school to school until it made its way to my basement. Pillows seemed like a good idea when I started, but they have since lost all the their fluff and were put out of their misery. In general I toss anything that is falling apart to prevent further messes. This might have been brought on by the Bean Bag Disaster of 2014 and is the reason that soft seating is limited in my room. Do you really need three boxes of paper clips in your desk? Just sayin’. And while we’re on the topic of supplies that multiply-you do not need as many elastic bands as you think you do. When you really need one there will be a child in your classroom playing with one when they shouldn’t be. Other people’s stuff was clogging up my space. I found all kinds of things that other people “thought I might need” and I tossed it ALL. It was so freeing. I have since learned to just say no to other people’s lessons, baskets and books unless I am looking for one specific thing. So, my new clean space feels so much more relaxing and the best part of the clutter binge was that I didn’t have all those boxes to return to school for another year. I was able to get my materials down to a box or two per subject area (and those pocket charts and weird sized things still don’t fit). My classroom is much less cluttered and so is my basement! Be very careful when passing things along to other teachers. If it was a burden for you to go through, it’ll just make make work for them, too. And, I didn’t stop at classroom items. My family and I went through the whole house with this mentality. It was so freeing to get rid of things. We were able to get rid of one thousand items before the end of March. Yes, 1000! The more I started to clear things out, the easier it became. You can do it! As we were cleaning I found and entire box labeled scrap paper. Yes, I was keeping paper nobody wanted that I had literally pulled out of the recycling bin at school. It made a great photo for this post, but it has long since been sent onto the recycling depot. That rock is still in the garden, but it’s only until we can return it to its natural habitat one day. Mr. Ninja will not be pleased and to be honest, I’m likely to find something else I might need one day. Be honest. You’ve probably got a bird’s nest, wasp’s nest or stuffed muskrat hanging around because it’s loosely related to science, right? Repeat after me: I do not need to keep all the things. We’d love to hear about the most ridiculous item you’re hanging onto. Why do you think you’re still keeping it? Leave us a comment below. Happy spring cleaning! 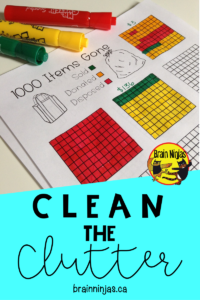 Want a copy of our Clean the Clutter organizer? Just sign up with your email and we’ll send you the password to the Resource Library where you can download it for free!